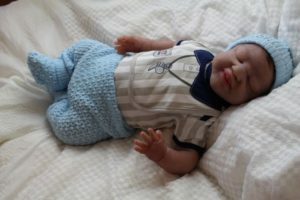 This newborn full body silicone baby boy is currently for sale on eBay. Details are taken from his listing. 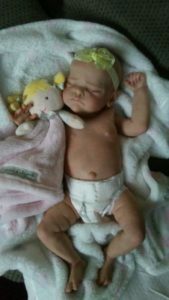 I have spent weeks working on this little cutie , I have sculpted, molded, poured and reproduced this cutie into the very soft and squishy eco flex 20. 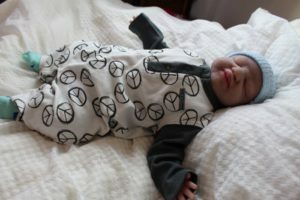 He weighs 15 pounds 8 ounces and measuring 23 inches, he is a big and chunky baby BOY. 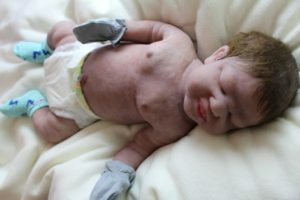 Shane has been painted with top quality silicone paints with many thin layers to get his realistic baby skin tone. He takes a bottle and a pacifier. 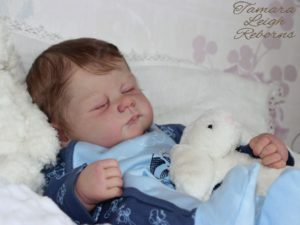 His eyebrow and lashes have been lightly painted his head has been rooted with Top quality soft slumber land mohair. 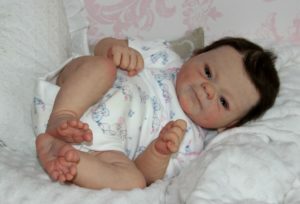 He as a attached head. please see all my pictures as they are apart of my description . 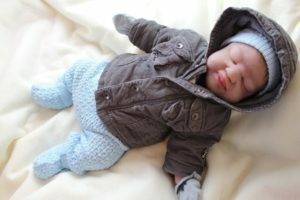 He will be coming home with all the outfits shown in photo plus extra, certificate , bottle diapers.